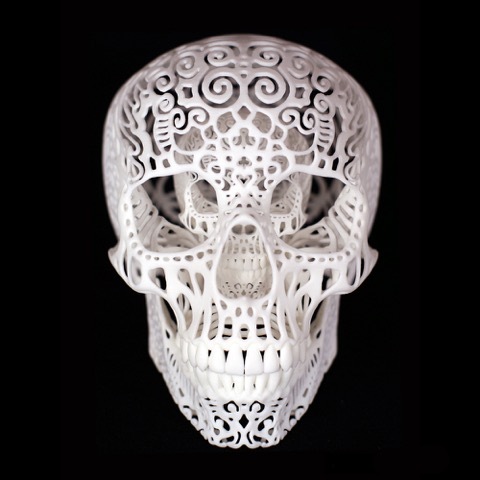 Joshua Harker (b.1970) is an American artist considered a pioneer and visionary in 3D printed art and sculpture. His series of unmake-able technically complex tangles is credited as the first to break the design and manufacturing threshold of possibility. His pursuit of a process to bring his works into the 3rd dimension culminated after nearly 20 years in a perfect storm of software development, materials engineering, and 3D printing technology advancements. He went on to navigate the creation of his “Tangle” series in the archival material of cast bronze, thus bridging the traditional techniques of the past with technology of the present. To fully appreciate the gravity of the pieces one must understand the practical impossibilities of their existence. This has been considered a landmark event in the history of sculpture and the chronology of the 3D printed medium and has made him one of the most recognized artists in the field. Along with his techniques, subject matter, and execution, his experimentation in the dissemination of his art through digital media and the internet has garnered him international recognition. He is among thousands of collections and his work has appeared in many publications worldwide. Joshua’s young life included post 60’s off-grid communal living, Hell’s Angels babysitters, complete artistic immersion, and family tragedy. Joshua attended the Kansas City Art Institute and St. Ambrose University as well as later studying anatomy & forensic arts. His parents were both artists connected to Grant Wood through his colleague & former student John Bloom & his wife Isabel. Joshua’s fascination with digital sculpture and 3 dimensional printing technology began as a commercial sculptor and designer in the toy, invention and design, special effects, and product development industries. In the late 90’s he founded a boutique design and development firm servicing some of the largest global properties and corporations. He served as its president & CEO through 2008 after which he left his post to return to art."